Regina Barzilay and James Collins have been named the faculty co-leads of the Abdul Latif Jameel Clinic for Machine Learning in Health, or J-Clinic, effective immediately, announced Anantha Chandrakasan, dean of the School of Engineering and chair of J-Clinic. Institute Professor Philip Sharp will also serve as the chair of J-Clinic’s advisory board. 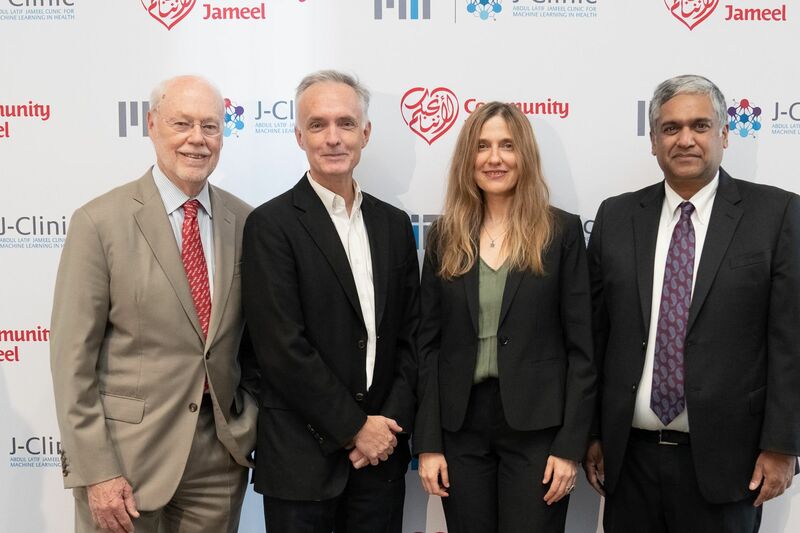 Launched on Sept. 17, J-Clinic is the fourth major collaborative effort between MIT and Community Jameel, the social enterprise organization founded and chaired by Mohammed Abdul Latif Jameel ’78. A key part of the MIT Quest for Intelligence, J-Clinic will focus on developing machine learning technologies to revolutionize the prevention, detection, and treatment of disease. It will concentrate on creating and commercializing high-precision, affordable, and scalable machine learning technologies in areas of health care ranging from diagnostics to pharmaceuticals. Barzilay is the Delta Electronics Professor of Electrical Engineering and Computer Science at MIT and an investigator at the Computer Science and Artificial Intelligence Laboratory (CSAIL). She also co-directs a Machine Learning for Pharmaceutical Discovery and Synthesis Consortium that aims to develop AI algorithms for automation of drug design. Barzilay is a recipient of a MacArthur Fellowship, the National Science Foundation CAREER award, the MIT Technology Review TR35 Award, and a Microsoft Faculty Fellowship. She was also elected an Association of Computational Linguistics Fellow and an Association for the Advancement of Artificial Intelligence Fellow. Barzilay received her BS and MS from Ben-Gurion University of the Negev, Israel. She earned a PhD in computer science from Columbia University and did her postdoctoral work at Cornell University. Collins is the Termeer Professor of Medical Engineering and Science, a professor of biological engineering at MIT, and a member of the Harvard-MIT Health Sciences and Technology faculty. He is also a core founding faculty member of the Wyss Institute for Biologically Inspired Engineering at Harvard University and an Institute Member of the Broad Institute of MIT and Harvard. Collins’s numerous honors include a Rhodes Scholarship, a MacArthur Fellowship, and an NIH Director’s Pioneer Award. He is an elected member of all three national academies: the National Academy of Sciences, the National Academy of Engineering, and the National Academy of Medicine. He is also a member of the American Academy of Arts and Sciences, the National Academy of Inventors, and the World Academy of Sciences. Collins earned an BA in physics from the College of the Holy Cross and a PhD in medical engineering from the University of Oxford. Sharp is an Institute Professor at MIT in the Koch Institute for Integrative Cancer Research. In 1993 he shared the Nobel Prize in physiology or medicine for the discovery of split genes and in 2004 was awarded the National Medal of Science. He co-founded Biogen and served on its board for 29 years. In 2002, he co-founded Alnylam Pharmaceuticals and continues to serve on its board. He is chair of the scientific advisory committee of Stand Up to Cancer and a proponent of Convergence, the engagement of engineering, computational and physical sciences in biomedical science. “The J-Clinic is an exciting opportunity for MIT scientists to bring machine learning to health care. I look forward to chairing its advisory group to accelerate its growth and impact,” says Sharp.